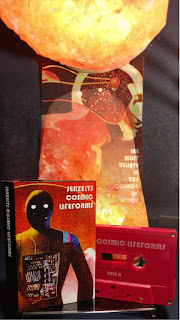 Cosmic Lifeforms is a familiar science-fiction tale of human/machine hybrids which realize sentience and escape the planet on which they are enslaved. It opens with a beautiful time-lapse montage of baby stars and planets in the playpens of their galaxies. As we focus on one planet in particular, we hear life developing--slowly at first--progressing more rapidly, as the life formed by chance forms its own life by choice. Jenzeits use analog modular synths and an app to narrate this tone tale. There’s a definite narrative here, tension builds and breaks several times before the credits roll on “Twilight Nights”. Drawing from every decade since the 1960s (or perhaps the “beginning” of “time”) Jenzeits channel more artists than I care to name drop. There’s a lot of this cosmic voyager bedroom synth around, and this is streaming and available on the cheap as well. If that’s your jam, check this out.